Wilson Kipsang yesterday became the 32nd man since WWII to hold the marathon world record. He broke countryman Patrick Makau’s World Record by 15 seconds, setting a new mark of 2:03:23. A spectacular performance, in which he managed his effort perfectly, showing patience and the right level of aggression at the right time to finish superbly. Today I share some thoughts, based on the chat on Twitter yesterday, concerning the race, the pacing, and the prospects for that sub-2 hour marathon that people seem very eager to talk about. I’ll tackle the analysis in two parts, one analyzing the race, and later, something on the 2-hour barrier. 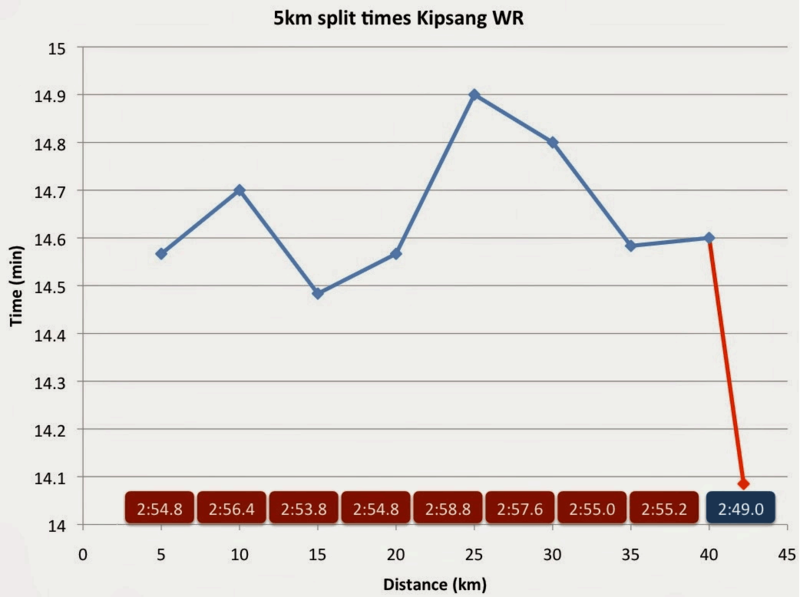 Below is a graph showing the 5km split times and paces for the race, and includes a projection for 5km based on the final 2.2km, where Kipsang really picked it up. So, they start fast – the projected time all the way through the first 20km was under the WR. They reached halfway in 61:32, projecting a 2:03:04, and that was, if anything, perhaps a little too fast. It set the second half up as a really attritional race – nobody was going to run even or negative splits, and the question was whether any of the big three – Kipchoge, Geoffrey Kipsang or Wilson Kipsang – would hang on well enough to break 62 and the World record. The pace got slower after halfway. The section from 20km to 25km was the slowest of the race, which you can see as the peak in the graph above. Note however that the pace never once dipped below 3:00/km, and that the range was between 2:54 and 2:59. That’s remarkably precision. That slow 5km interval, and the one immediately after it (25km to 30km) were probably critical to the record because they set the final 10km up. I have my doubts around how the result would have looked had they continued to push at the 2:03 pace. It was important to regather, even though it meant slowing down to around 2:06 pace for a short while. Once regathered, Kipsang was mighty impressive in the final 10km. He took the initiative, as the “senior” man in the race, and drove the pace even faster. Only Kipchoge was able to respond and that was fleeting too. Kipsang ran a few kilometers in 2:49 in that second 30km to 40km, which means there was some in the range of 3:00 too. So it was a little more varied there, indicating either a change in wind direction (the weather was almost perfect, but not quite), or that Kipsang was digging deep, then finding he needed some active recovery, then digging deep, and recovering, and so on. Eventually, with 2km to go, he found the big final effort and finished incredibly fast – 2:49/km for the final two, and that was ultimately the difference. 15 seconds, and it came, largely in those final kilometers. Of course, that’s only part of it – the work had been done to get there. Taking a broader view, Kipsang paced the marathon almost like a mile race. If you break the race into quarters, you get the following for his 10km splits: 29:16 – 29:03 – 29:42 – 29:11 (plus that final surge). The “shape” of that race looks like a typical mile WR – Fast start, slowest in the third quarter, and then the surge. It was an excellent management of his physiological resources. In terms of where improvement can come, Kipsang finished very fast, suggesting a reserve, and the ability to go slightly faster. But it’s not huge. It’s not like when you or I finish a 10km and find a surge in the final kilometer that sees us run 20s/km faster than our race average. In this world, a reserve is being able to go 4-5 seconds per kilometer faster, and so it really is on the limit. Kipsang is also 31, in his fourth year of marathon running, and set this WR in his 7th race, which is a long time to reach a peak. Typically, the fastest marathon of an athlete’s career happens between 2 and 4, though there are exceptions (Gebrselassie took a while to perfect the race, and then improved steadily quite late). Kipsang then, may follow a similar approach, and improve again, but the ‘safer bet’, as it always is, is that he won’t. Behind him, Kipchoge made a big improvement on his debut, which was already impressive at 2:05 from earlier this year. He’s now a 2:04 man, and on the path towards 2:03, so it will be very interesting to follow whether he can continue that, or whether there’s a ‘glass ceiling’. The same goes for Geoffrey Kipsang, who “only” ran 2:06:26, but was there for three quarters of the race, and who may yet be able to turn that into an entire race one day. Then of course there are the Ethiopians, a group of young runners in the 2:04 category, and who may challenge, and there are other Kenyans who’ve been hovering in the same region. Marathon running is incredibly deep and strong at the moment, which means we’ll get to enjoy similar races and record attempts at least three or four times a year for the foreseeable future. But for now, it’s Wilson Kipsang, with a spectacular performance, who holds the distinction of being the fastest ever. More later on the 2- hour marathon. Final thought – the guy who ambushed the breaking of the tape to promote prostitution has been charged with trespassing. What should happen to him is that he should be sent to Kenya, preferably Eldoret or Iten where all the elite runners train, for three months of community service work. Let him serve in any was possible (he can carry water and drive behind the runners on long training runs), and learn some respect for the runners of Kenya in the process. Idiot.